The vacant lots, old warehouses and dilapidated housing that have long characterized much of urban Fort Lauderdale are disappearing quickly. Revitalization of the area known as Flagler Village, west of U.S. 1 and sandwiched between Broward Boulevard and Sunrise Boulevard, got started a few years ago with FAT Village, (Flagler Arts and Technology), a strip of old warehouses that has been converted into galleries, performance spaces and hip businesses that cater to millennials. Developers have followed, and now the roughly 300-acre neighborhood has 42 projects either in the planning stages or under development. Most are rentals aimed at young professionals, but there are also condo projects like Flagler 626, a 12-story tower at 626 Northeast First Avenue, which is expected to have 97 units including three townhomes at an average price of $350 per square foot. The project, which is in the final stages of the approvals process, is being developed by Israeli investors BRYL Development, LLC, and designed by Stewart Robin of Nest Plan. Units will range from studios to one-and two-bedrooms, with 671 square feet to 1,580 square feet. Morgan Group, a Texas-based developer, has several projects in Flagler Village, and earlier this year sold the Edge at Flagler Village, a 332-unit apartment complex at 475-479 North Federal Highway to financial services giant TIAA for $114.4 million or $344,578 per unit. Miami-based Related Group developed and sold the Manor at Flagler Village for $149 million in 2015. Jaime Sturgis, sales director for Metro 1’s Broward office said “the mantra behind the neighborhood is live, work and play,” and he said the area is starting to “hit critical mass, where we have enough residents to support full-time retail. ” Stugis said that means more adaptive re-use of old buildings like warehouses being turned into creative office spaces. Sturgis says mass transit is key to the future success of the area. All Aboard Florida is scheduled to launch its Brightline next year with trains running between Orlando and Miami. The line will have a station in Flagler Village and Fort Lauderdale’s proposed Wave street car project will have multiple stops in the area. “People are trending away from owning vehicles, and parking is a problem, especially in the urban core,” says Sturgis. Just to the north, the city of Oakland Park is developing a downtown “Culinary Arts District.” Anchored by the Funky Buddha Brewery, the area is attracting local residents and visitors to a several-blocks long mix of old buildings that have been converted into restaurants and culinary shops adjacent to Jaco Pastorius Park. D.R. Horton is building a townhome community called Eastside Village just to the north of the district — a sign Sturgis said of development coming to the area. 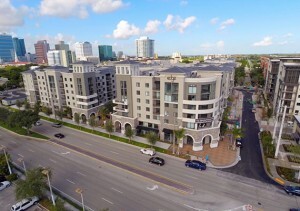 Sturgis said while millennials are drawn to Flagler Village, many of their parents are heading east to condo projects on Las Olas Boulevard or an area known informally as North Bay Village along A 1 A, where new luxury condo projects like the Gale Residences Fort Lauderdale Beach, Auberge Beach Residences & Spa and Paramount Fort Lauderdale Beach are being built. “Luxury is the word I would use to define it,” says Sturgis. “They’ve lived out west and no longer want to carry the big ranch.” In May, Related Group said a Boca Raton buyer reserved a 4,300 square-foot penthouse unit at its Auberge Beach Residences & Spa for $7 million or just under $1,628 per square foot, beating a previous record set last year at the Ritz-Carlton Fort Lauderdale.